The main thermodynamic constants ΔН0298 (change in the enthalpy of formation) and S0298 (entropy), as well as the equation for the dependence of the heat capacity in the entire temperature range of existence were first obtained for the compounds with the β-quartz structure (PQS) and beryllian indialite (BI). 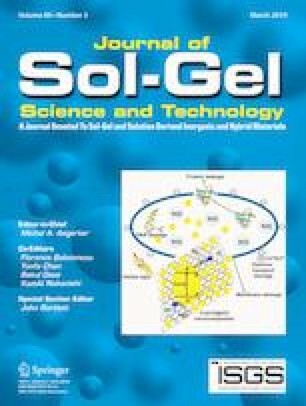 The study samples were obtained by the sol-gel method from the solution of nitrates of beryllium, magnesium and aluminum and tetraethoxysilane. The calculated ratio of the components in the resulting MgO:BeO:Al2O3:SiO2 mixture was expected to be 2:1:1:6, respectively. The solid-phase synthesis included sintering the dry ground mixture in air and sampling at the crystallization temperature of the PQS and BI. With the physic-chemical analysis the traditional Babushkin method with the Taranenkova modification was used to account for the multi-component nature of the compounds. The thermodynamic analysis of both phases was accomplished with the scheme for a complex oxygen compound consisting of solid oxides, not having polymorphic transformations and melting congruently. The assumptions made do not contradict the data on the phase formation and thermometry in the phylogenetic series, their primary and final members being PQS and BI. The obtained data are appropriate for correct tetrahedration of the BeO–MgO–Al2O3–SiO2 system, and for calculating the probability of the formation of its phases. Dependence of heat capacity on temperature for β-quartz structural type compound (a) and beryllian indialite (b). The compound of the β-quartz structural type (PQS) and beryllian indialite (BI) are the first and last links of the phylogenetic series, which exists in the subsolidus region with sol-gel samples prehistory. 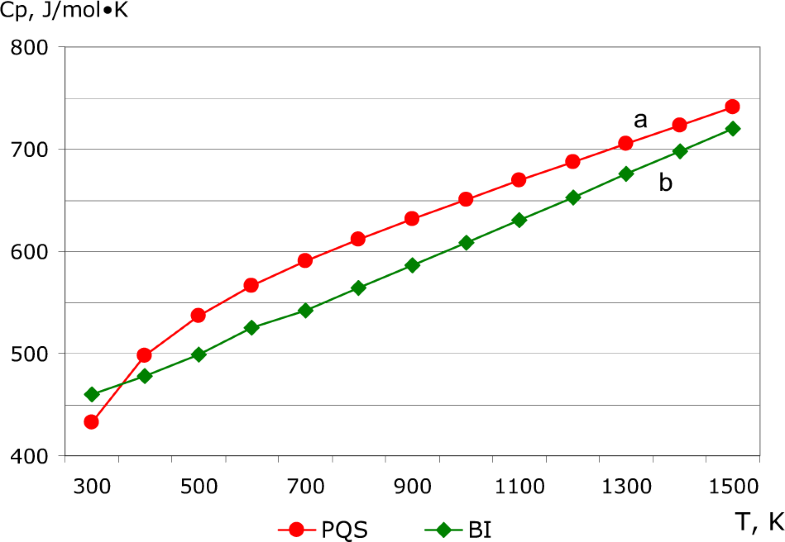 The change in the enthalpy of phase formation at 298 K for the PQS and BI as well as their entropy was calculated as: ΔН0298(PQS) = –8954.89 kJ/mol, S0298(PQS) = 341.48 J/mol·K and ΔН0298(BI) = –9017.08 kJ/mol, S0298(BI) = 388.01 J/mol·K. Ср(BI) = 383.63 + 223.99∙10−3 ∙ Т + 8.15∙105 ∙ Т−2. The study was performed by the governmental assignment in terms of Project 0350-2016-0024. The authors appreciate very much the contribution by Dr. Michael Alekseevich Mikhailov, the founder and leader of beryllian indialite researching.